Since IndigoHoneycomb has changed direction, I wanted to start off by delving in the basics of Sustainable and Ethical Design. Beginning with Fast Fashion vs Slow Fashion. Like ‘Fast Food’, which is made quickly, served quickly and eaten quickly; ‘Fast Fashion’ works in the same way. ‘Fast Fashion’ is not a style or a particular brand, but a term for a process of making and buying an item quickly. As trends pass with increasing speed, clothing retailers must keep up with the constant demand for new styles. Cheap imitations of designer items for those who can’t afford to spend £200 on a t-shirt. Clothes are made quickly and as cheaply as possible, shipped to the UK, impulsively brought for relativly low cost, worn only a handful of times (on average women in the UK on wear each item in their wardrobe 4 times!) then thrown in the trash, ending its brief life in landfill. The quality of these garments is poor to say the least. I’m sure we can all recall those jeans which tore after a few wears and that dress whose seams split in the first wash. Colours fading, buttons falling off and jumpers pilling are only a few of the signs that these items are not designed for long term usage. 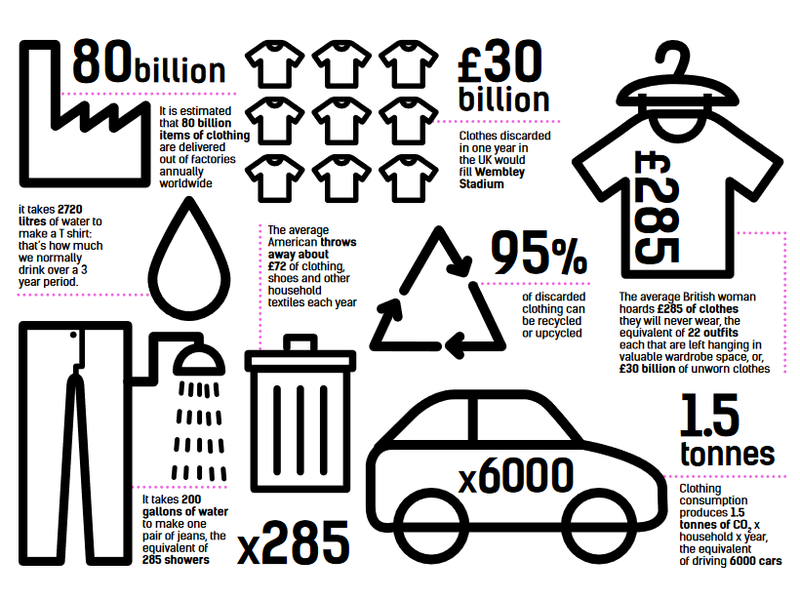 The retailers give little regard to the environmental impact; vast amounts of water are used, toxic chemical dyes are washed in to our oceans and not to forget the 85% of all clothing ends up in landfill. The ethical impact of the making process is also often an afterthought. The Rana Plaza collapse back in 2013 is a tragic example of the working conditions which resulted in the deaths of 1,129 garment workers. The factory was assembling garments for the European fast fashion market, including garments headed for Primark, Mango, Monsoon Accessorize and Matalan. Unfair wages, sexual harassment of female workers and poor working conditions are common place in most ‘Fast Fashion’ factories. Well dear reader, there is an alternative. And it’s called ‘Slow Fashion’. The Slow Fashion movement proves to change the face of the fashion industry. Slow Fashion starts with the consumer, asking the public to buy fewer, better quality items which they will wear indefinitely. Less public demand for ‘Fast Fashion’ = less companies make ‘Fast Fashion’ garments. The ‘Slow Fashion’ movement calls on retailers to become more transparent about their manufacturing practices. Encouraging positive and progressive practices, such as fairer working wages, providing unions to speak up for workers’ rights, creating less waste and lowering their carbon footprint. Shoppers are encouraged to ‘vote with their pay check’. The idea being that every pound you spend is a vote for that company. By buying from Fast Fashion retailers, we are voting for them, saying ‘Yes, I agree with what you do and I want you to continue’. By buying from ‘Slow Fashion’ brands or brands transitioning to ‘Slow Fashion’ practices, we are voting for them and what they stand for. We all have a choice about who to vote for, make sure you choose wisely. Images from The Guardian + Fashion Revolution. Next Is H&M Conscious as sustainable as it claims?